I am really sad that Omerica doesn't really have much to offer in the small gauge category. You have to be at least a 2g for anything more than a basic plug. Which is sad because I feel like you could give a 6g a larger front flare and then have room for some designs... That would be nice. And there is no way I am stretching larger. Can't you just order directly from BVLA? I really am in no position to buy rose gold tunnels right now,so I didn't look that far into how you go about ordering stuff from there.But I know sometimes I've been on sites where I'll find something really amazing that no one else has,only to find out they're wholesale only.But weirdly enough,the day after I found that site,the piercing place near me posted pics of a few things from BVLA,& said they were now taking custom orders for that company.So if they can do it,I don't see why your piercing place couldn't. But I'm just dying to know what their prices are-I just want to know if it's at least a possibility of something I could maybe afford down the road. Nope, you have to get BVLA stuff from shops that sell it. My piercer replied to me on Facebook and said she can order from there, but she has to have a minimum amount but she does have someone else wanting something from there. Unfortunately she said those are only available in white, yellow, and rose gold and there is NO way I'd be able to afford gold anything at the moment. I was hoping they'd do steel or titanium. Even steel/ti septum clickers are expensive though. mouse2cat wrote: I am really sad that Omerica doesn't really have much to offer in the small gauge category. You have to be at least a 2g for anything more than a basic plug. Which is sad because I feel like you could give a 6g a larger front flare and then have room for some designs... That would be nice. And there is no way I am stretching larger. Yeah I know what you mean, I always felt the same way at smaller sizes. 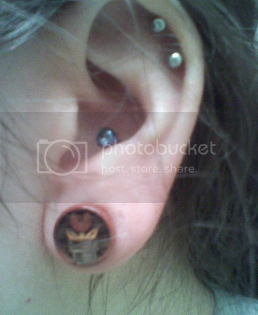 Even now I feel like there isn't enough detail in 7/16" plugs! I hope the ones I ordered look nice. 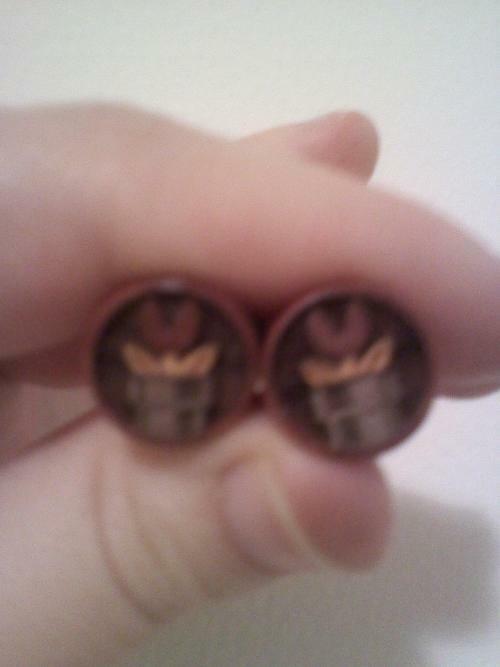 The plugs I got from Omerica are 7/16. I too were concerned that the pattern/design wouldn't show up enough but just bit the bullet and ordered. I can only talk for the ones I got obviously. The 'Missing piece' ones have the piece cut right out of the centre of the face of the plug with enough of the jigsaw puzzle lines around it to get the idea. You wouldn't really go any smaller with this one (if you can!). The music note ones are a simple carved design, perfect for any size plug id say from 0g really. The argyle ones have the diamond shapes inlaid into them so probably can't go smaller than what I got them at but they show up pretty well. All in all I think Omerica probably take into consideration the amount of detail a customer can and would expect on their ordered plugs so allows for this when nominating the minimum size you can get them in. I understand and I don't really expect extreme complexity. But a little something would be nice. And they could make a top hat style with a bigger front. They do offer some of their designs in a top hat style, as well as single and double flare, but the front wouldn't be much bigger than a flared plug. They do custom stuff, so if you wanted you could get something made that had like a Mayan flare on it so the front was bigger. I'd email them and ask. It can't hurt. Got them in the mail today. Kind of wish I would've bought 1/2" instead of 7/16" because they're smaller than I'd like (I expected the front to be bigger) but they're still cool. I'm not gonna put them in my ears for another week or so since I stretched pretty recently. Okay, I couldn't resist and put them in. 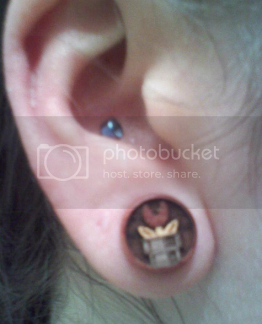 Only left them in for a second because they felt very tight but I'm a lot happier with the way they look in my ears. They still look tiny though. I should also add that they don't look pink at all in real life, which was kind of disappointing. Sweeet plugs lady. Good choice. And yeah a little too tempting hey! !